Hire skate $1 or roller blades $3. 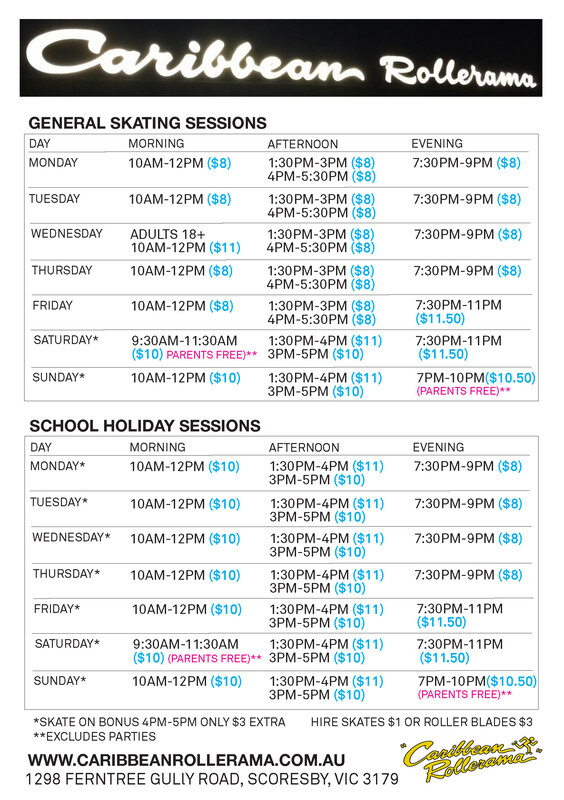 Check our Holiday Sessions timetable for public and school holidays. Check our General Sessions timetable for usual times. Group sessions are a great way to save money because you can take advantage of our group concession rates. Have a healthy, fun night out while raising money for your group at the same time. Adults take over Wednesday mornings (except school holidays) to learn to skate and participate in activities, games and exercises. It is a great opportunity to either bring a friend and have some fun, or make some new friends and there is a coach provided at every session. After you’ve burnt up all that energy, why not head next door to the Caribbean Gardens and Market and try our delicious new lunch menu. Check out the special skate sessions we have coming up – on our new calendar – use the list option for easy viewing!